Happy Friday, everyone! 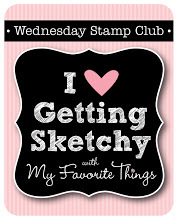 This week's MFT Wednesday Stamp Club is all about using cork and felt on your projects. 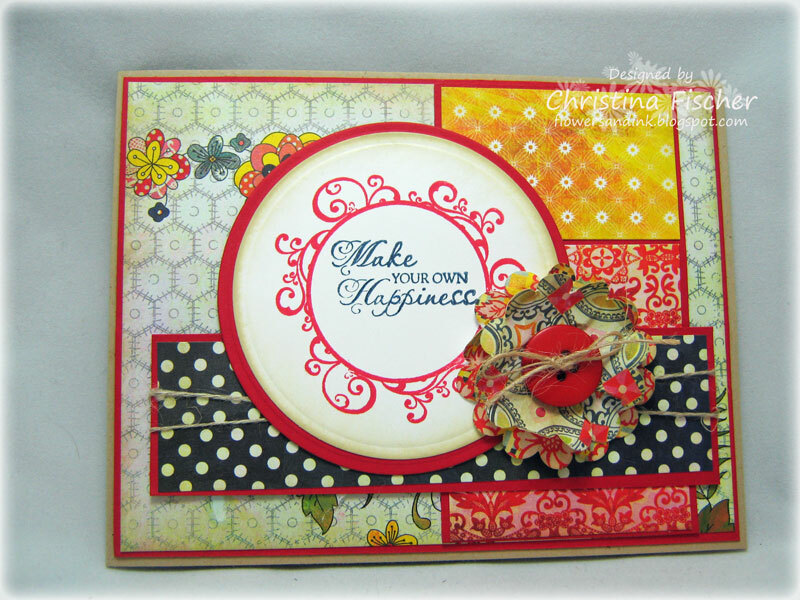 MFT's Cork Sheets and My Favorite Felt are easily cut with Die-namics, so of course I had to use them, too! I have two brothers-in-law who are turning 50 next week, so I was inspired to make a 50th birthday card! I used the Sunshine die on the cork and the Fresh Cut Grass die on the felt. I turned the grass upside-down to make some fun fringe! The sentiment and numbers are from Bling 'Bers. I embellished with Baby Braddies and an Earth Girl Button. 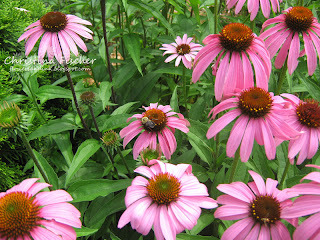 I hope you all have a great week -- thanks, as always, for visiting! I used Random.org to choose the winner... Sheila Davis! Congratulations! Sheila, email me your address and I'll get your goodies out to you right away! 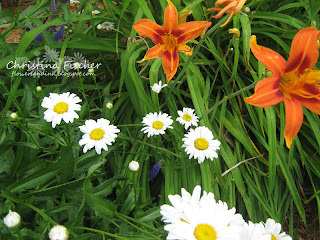 Today I thought I'd share some photos from the garden. I've mentioned before that we have perennials and annuals around our deck area. We also have a small raised-bed vegetable garden where we grow tomatoes and peppers. There's also some dill, cilantro, basil and strawberries in the veggie garden and in pots on the deck. 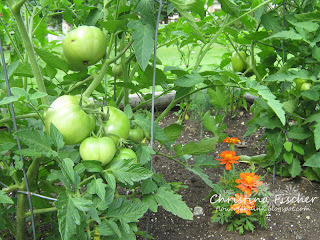 I can't wait until the tomatoes are ripe! Homemade salsa.. yum! Basil and tomatoes... the perfect summer pair! Okay, enough food talk -- I need to get something done around here! Thanks for stopping by today -- have a great day! Happy Sunday, everyone -- and Happy Father's Day to all the dads out there! Yesterday we went to our neighbor's graduation party, and here's the card I made for her. I took advantage of the SCS Color Challenge (Mellow Moss, Barely Banana, Real Red) and the Ways to Use It Challenge (Ribbon). Of course I had to use this sweet Pure Innocence image! I curved a little bit of Fresh Cut Grass along the bottom of the oval. I combined crocheted ribbon and grosgrain ribbon -- I love the way it looks! 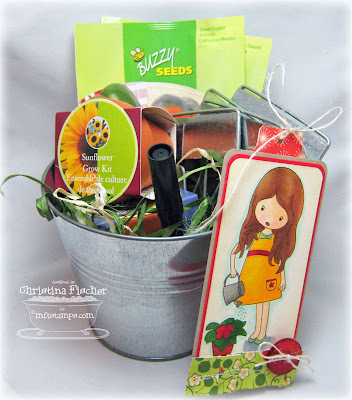 There are still a couple days left for my BLOG CANDY giveaway -- click HERE to find out more! I hope you enjoy your day today -- thank you so much for stopping by! Stamps: Book in Hand (MFT) Ink: Memento Tuxedo Black (Tsukineko) Cardstock: Mellow Moss, Barely Banana, Real Red, Basic Black (SU! ), Cream Perfect Paper Panels (MFT) Paper: Junebug 6x6 pad (BasicGrey), Nightlight (October Afternoon) Other: Die-namics Jumbo Scallop die, Die-namics Fresh Cut Grass die, My Favorite Felt, Earth Girl button, Crocheted Ribbon, Bakery Blend twine, Baby Braddies (MFT); Copic Markers; Oval Nestabilities (Spellbinders), Real Red Grosgrain, dimensionals (SU! ), sewing machine Card Size: 5.5" x 4.25"
A Special Sale to Help Special Friends! Many of you have read THIS post about Eric Liles's battle with cancer and the impact it’s having on the Liles family. Susan Liles designs for MFT, TCP and VERVE, and all three companies have banded together in a fund-raising effort that also benefits YOU! In addition, the three companies are donating a portion of the proceeds for the next three days directly to Susan and Eric so they can devote their energy and time toward healing and caring for their children and not worrying about how to pay for rising medical bills. The code for MFT to save 10% is SusieQ. You’ll enter it at checkout in the promo/discount code field and click “Redeem.” It will discount everything on the site, no exclusions! Thanks so much for stopping by today! 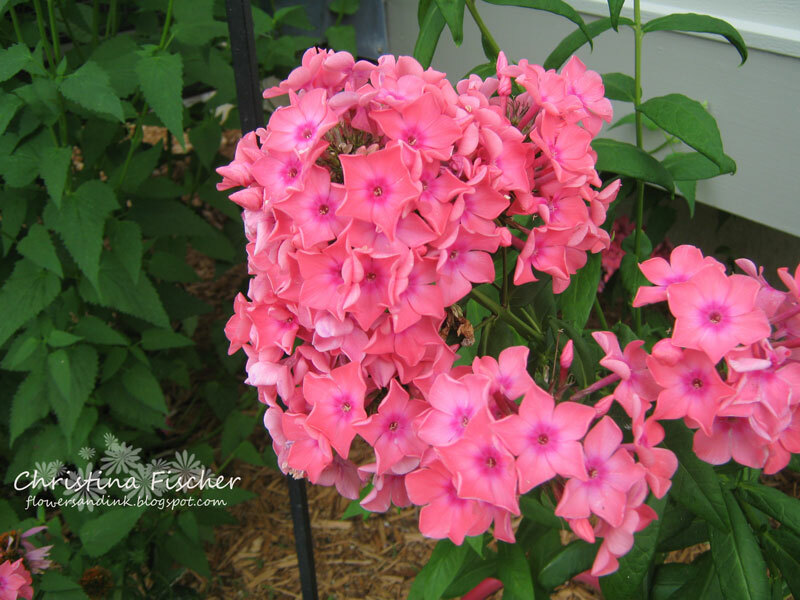 Have a fabulous Friday! 20 Years... It's Time to Celebrate with BLOG CANDY! I made this frame for him (okay, for us). The photo was taken just this past weekend at the wedding of two sweet young friends. I had seen Julia Stainton do her embedded rhinestone technique on her blog, and I have been dying to try it. I'm thrilled with how it turned out! 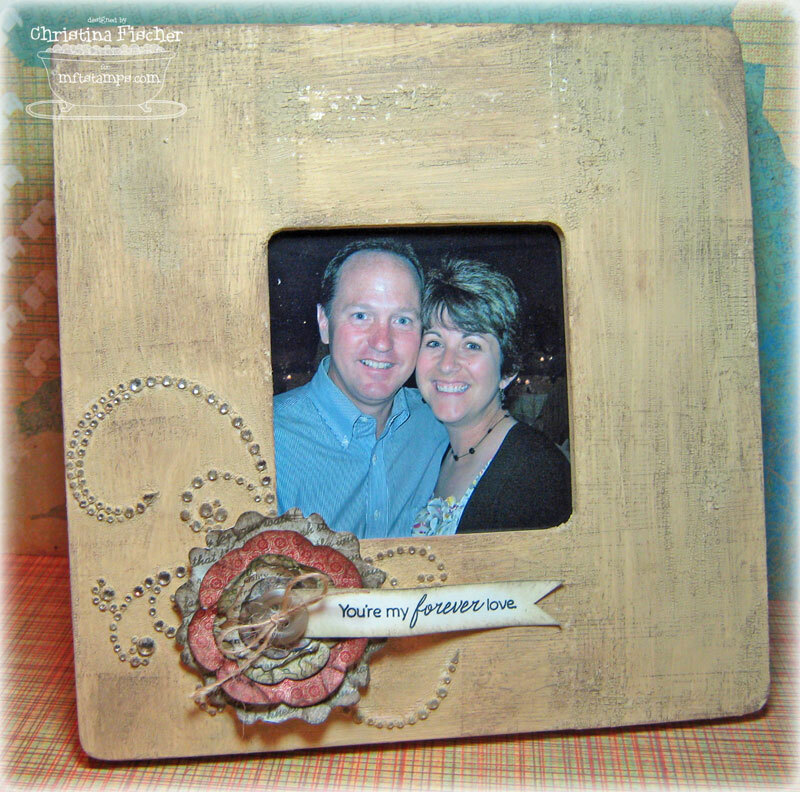 I covered the frame with Tim Holtz Distress Crackle Paint in Antique Linen, then I sponged some Walnut Stain Distress Ink over the cracks. I lightly stamped a sheet music background (from CHF) randomly over the frame using the Walnut Stain ink. 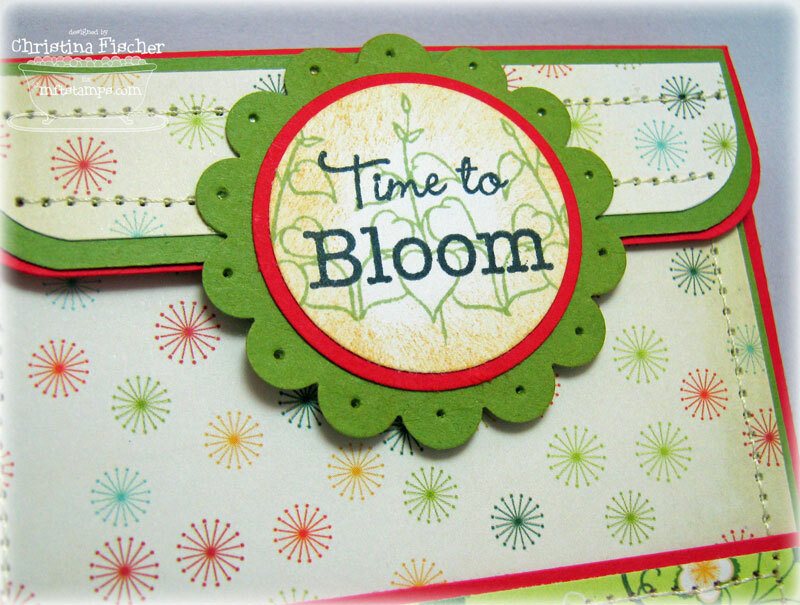 For the flower I used a combination of BasicGrey Boxer and MFT Take Note papers. 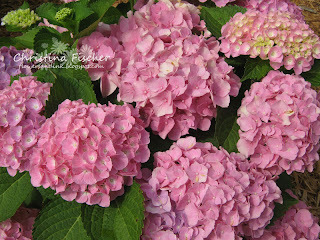 I cut them with Blossom and Peony Nestabilities. The button is from the new MFT Earth Girl buttons. 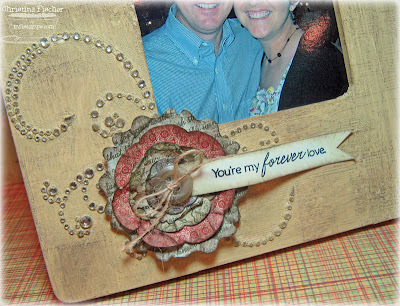 The sentiment is from Clearly Sentimental about You -- one of my all-time favorite sentiment sets. So, who wants to participate in my little love fest?? Simply leave a comment here on THIS post between now and Tuesday, June 22, at 11:59 EST. Tell me about your wedding, your favorite anniversary, or any little love story you have to share! I'll use Random.org to choose a winner and post it a week from today, Wednesday, June 23. Sound good? I'm off to enjoy the day with my hubby -- Happy Anniversary, Chris! Thanks for stopping by -- I always appreciate it! 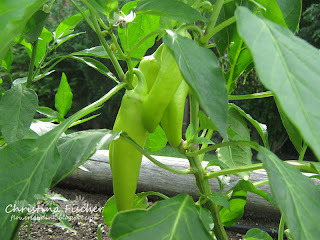 My second-favorite creative outlet (next to papercrafting, of course) is gardening. 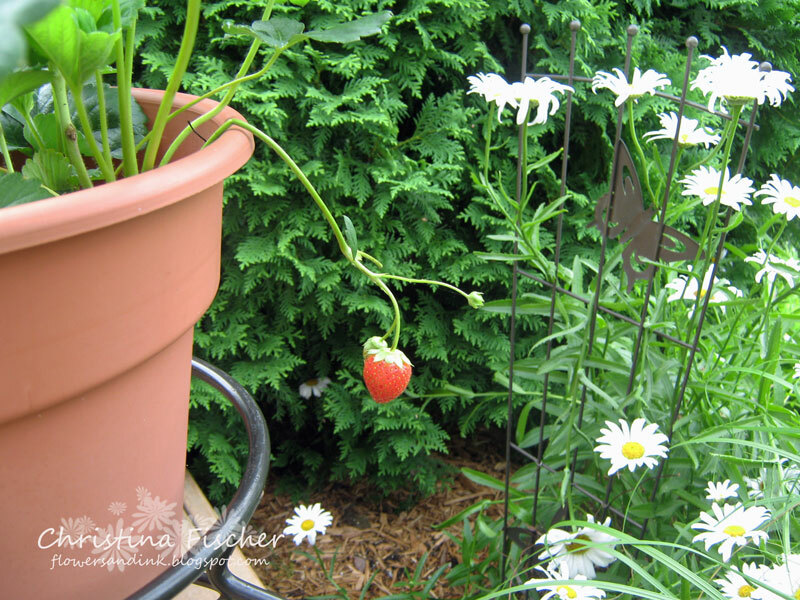 We have perennials and annuals around our deck area, and we have a small raised-bed vegetable garden as well. I'm telling you, this WTG set is SO me! 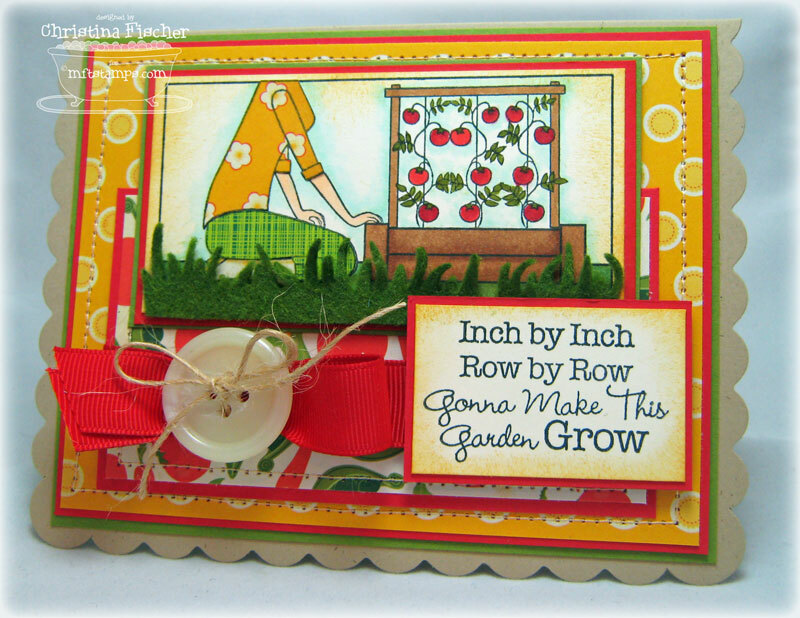 :) I had fun making this card -- I did some paper piecing, and I used the Die-namics Fresh Cut Grass die with My Favorite Felt - Earth Girl. I also made a box which can hold seed packets. 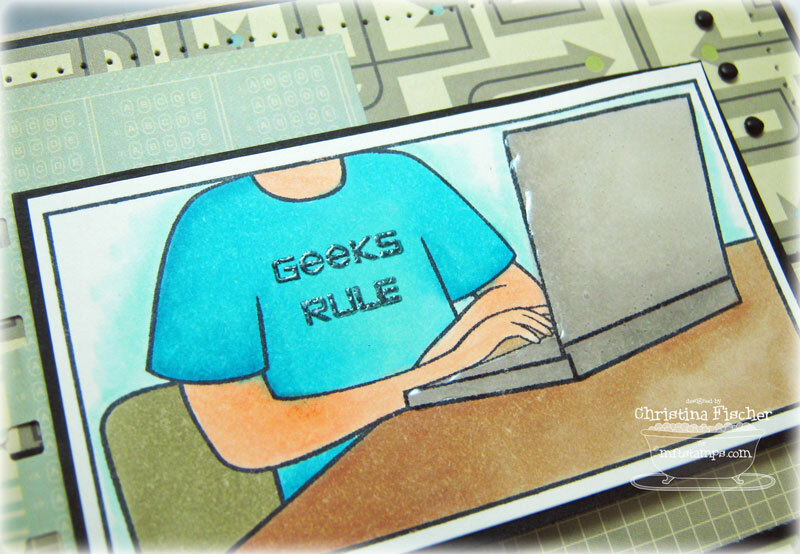 More Die-namics on this project -- this time the Jumbo Ric Rac die with the Grosgrain Texture Board! 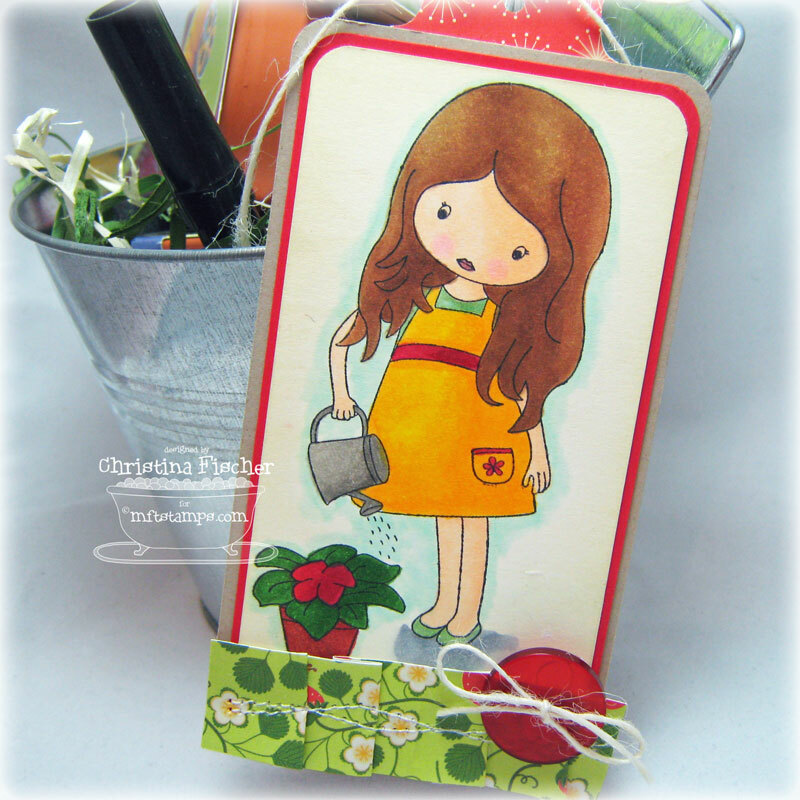 I used an image from Who's That Gardening Girl? 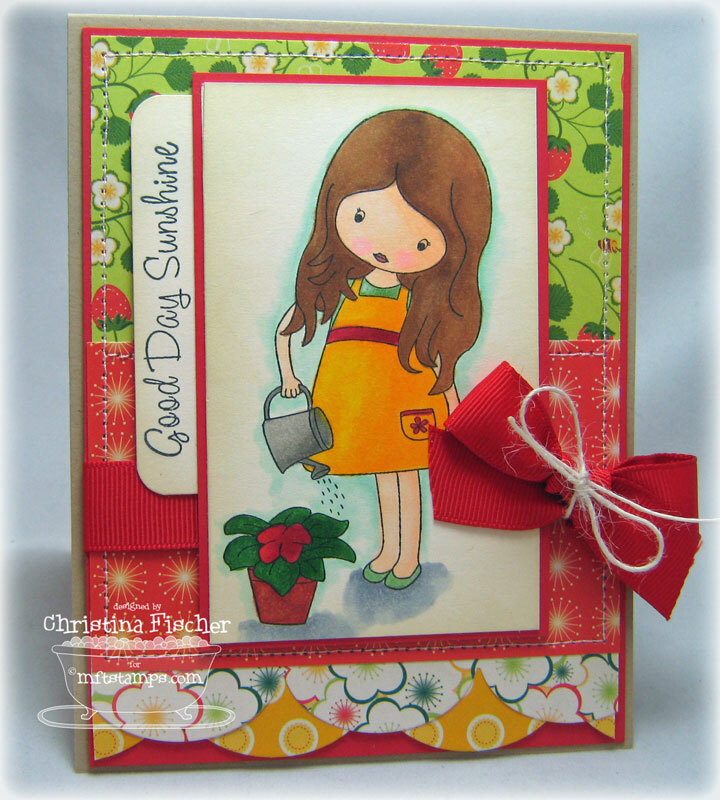 with a sentiment from the Green Thumb Mini Set. 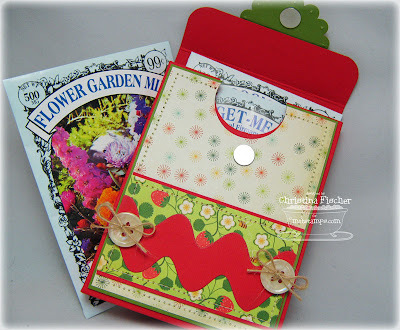 The seed packets are inside the box! Happy Saturday, everyone! I haven't participated in the SCS Sketch Challenges for so long, so I was happy to have a chance to play along with this week's challenge. We are going to a wedding tonight, and this great sketch was perfect for the card I needed to make. The sentiment is from the MFT set Clearly Sentimental about You. The paper on the background and on the chipboard heart is from the wedding invitation -- I scoured my paper stash to find some patterns to coordinate with it. Of course, I had to add a row of Die-namics Jumbo Scallops cut from My Favorite Felt. Rain has been dumping on us all day, but it loks like the sun is trying to come out! I hope it's a dry wedding! Thanks so much for stopping by today -- I really do appreciate it! 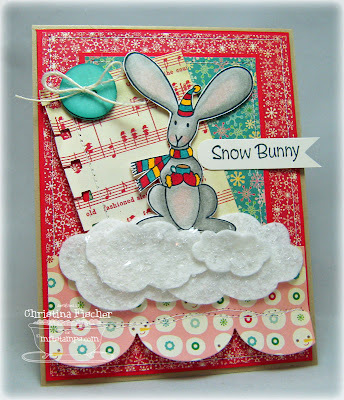 I chose to work with Snow Bunny Flopsey -- I know we're just starting summer, but this set makes me smile! To create the snow, I cut some My Favorite Felt with the Die-namics Cloud Trio die, then I covered it with some Glitzy Glitter. 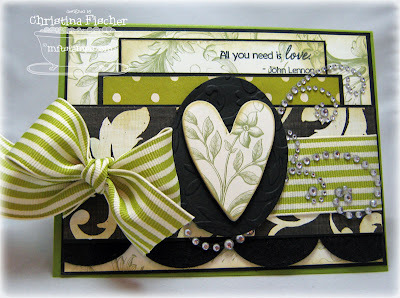 I used the Die-namics Jumbo Scallop die on the bottom paper panel. I colored with Copics and added lots of machine stitching. To help celebrate Flopsey, Kim is offering a shopping discount for you! Use the the code FLOPSEY for $3.00 off any Flopsey set! This code will be valid Thursday June 10 and Friday June 11th. Thank you so much for visiting today! Have a great day! I used some SU! apple papers (cut with the Die-namics Jumbo Scallops die), and I embossed the bottom panel with my Cuttlebug Numbers embossing folder. Perfect for a teacher! 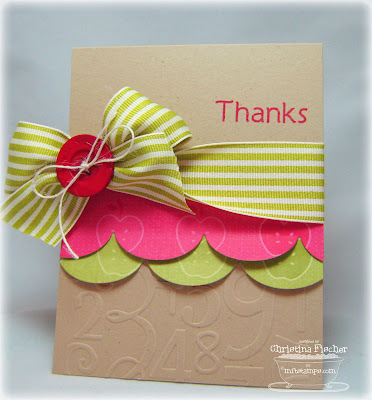 The sentiment is from MFT's Thanks a Bunch set. Note: the Die-namics Jumbo Scallops die and Cloud Trio die are currently sold out, but they'll be back soon! :) ETA: They're back in stock! You can find them HERE! 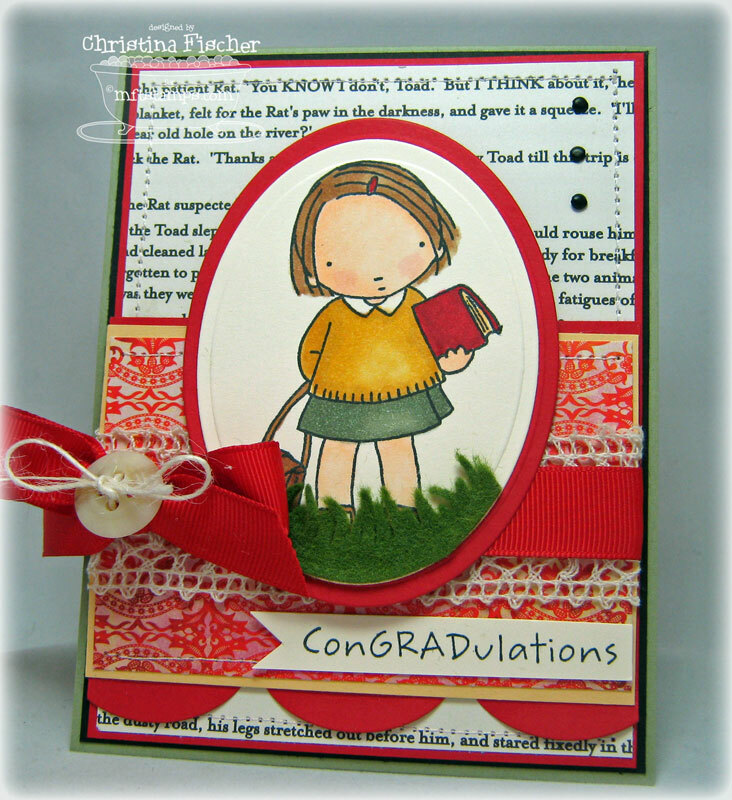 Here is a card I made for my niece's graduation. I decided to do something a little bit non-traditional. She is a smart, talented and confident individual, and she has accomplished so much during her time in high school. 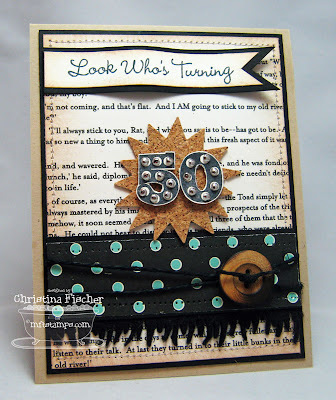 I wanted this card to reflect her fun personality and style! I used Jen's Sketch for You to Try. She always has the best sketches -- be sure to visit her on Saturdays if you need some inspiration for a layout! 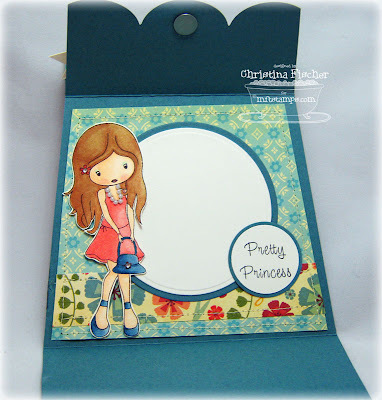 The stamp set is Fairy Tales from Verve Stamps, and the paper is June Bug by BasicGrey. 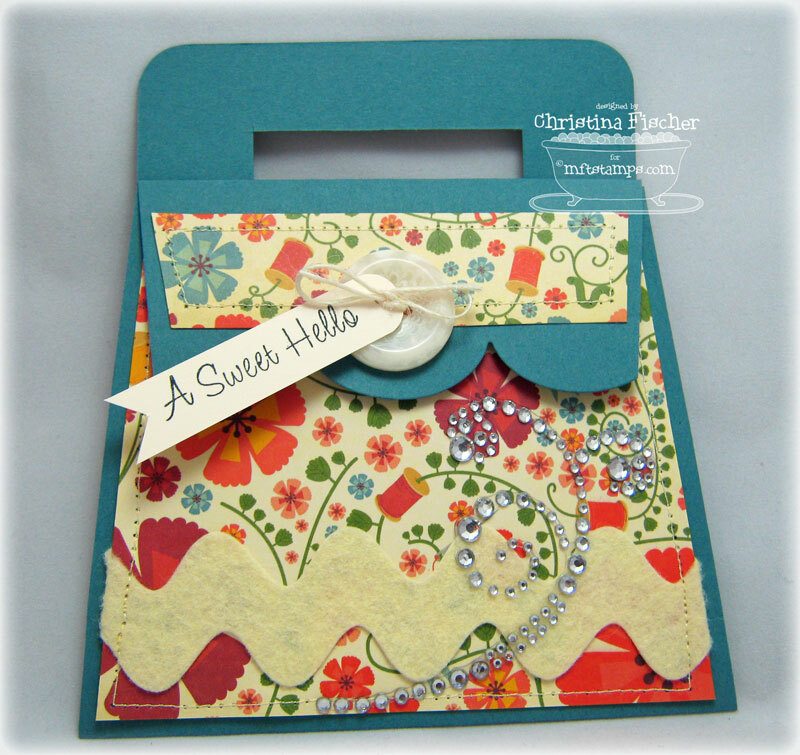 I made the flower by using my scallop circle punch on the patterned paper. I then crumpled up the scalloped circles, inked the edges, and layered them with a button on top. The top circle is folded and gathered in just a bit to make it smaller than the bottom circle. I used glue dots to hold the layers together. You can do this with several layers, or you can use other punches or flower dies to create a different look. Grab Your Handbag -- It's Time to Shop! Hi there! It's time to Hop and Shop with My Favorite Things! All of the new releases are available right HERE, right now! If you didn't start at Kim's Blog, you'll want to go back and catch up -- all of the new sets are are fantastic this month! My project features Jolinne All Dressed Up. What girl doesn't love to get dressed up for a night out? I had some fun making this handbag-shaped card. I'm quite sure there are handbag templates already out there somewhere, but I just started folding and cutting until I came up with this one! 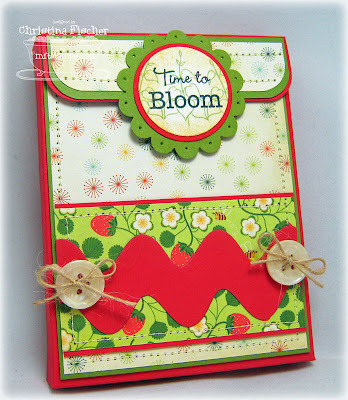 ;) I used the Die-namics Jumbo Scallops die on the top flap and the new Jumbo Ric Rac die on the My Favorite Felt. I used magnetic discs to hold the top flap closed. 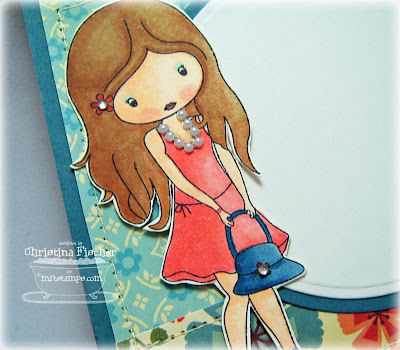 When the card is opened, you see Jolinne all dressed up! :) I colored the image with Copics, then I cut it out. 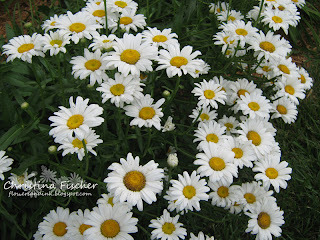 Next you'll be visiting the amazing Barbara Anders. I'm telling you, everything she creates is beautiful! I used Cosmo Cricket The Boyfriend paper, and I colored the image with Copics. I clear embossed the sentiment on his shirt, and I applied Crystal Lacquer to the laptop. Stop by Kim's Blog after 11 am to see the list of designers who are previewing sets today. Then be sure to meet us at the Release Party tonight from 8-10 pm (Caroline has her Kindergarten Celebration tonight, but I'll be at the party afterward)! And, as if that wasn't enough, you can Hop and Shop with us tonight when the sets are released at 10:00! That's all for now -- I'll see you back here tonight! Thanks so much for visiting! Hello! Happy Tuesday! Today the My Favorite Things DT is previewing three more sets: two new Jolinne sets and a fun Bath Time mini set. I used Jolinne In My Garden for my projects today. I put together a little bucket filled with garden supplies, and I attached a coordinating tag. Here's a closeup of the tag. I added some pleated paper to the bottom and punched a tab for the top. 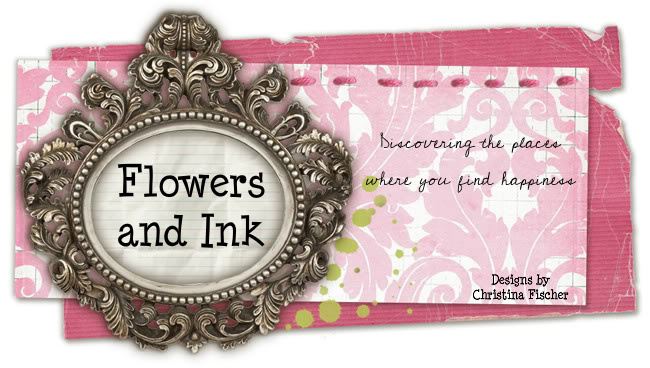 Kim will have a list of designers who have MFTeasers today -- visit her blog after 11 am! Also, there is still time to enter the MFT June Guest Designer Contest -- go HERE for the details!